The serving spoon is suitable for serving vegetable dishes, casseroles and classical side dishes such as rice and potatoes. Larger than the table cutlery, the bowl is round and ample sized to take up and serve food more easily. Every WMF cutlery includes a matching serving spoon. For the Nuova collection, designer Jutta Keil created special cutlery for delectable moments. From the brunch knife to the cake server to the salad servers – a range of cutlery to suit all occasions and tastes: egg spoons for soft boiled eggs, a lasagne server for hearty pasta bakes, espresso and latte macchiato spoons for Italian coffee specialities. For the tongs in the collection, designer André Stocker created universal and pasta tongs as well as asparagus and perforated serving tongs. The latter can be used for example for picking up mozzarella and tomatoes – leaving the marinade on the plate. The special cutlery and dimensionally stable tongs are made from polished Cromargan® and thanks to their sleek, timeless design, go well with all tableware.  WMF items of cutlery are available separately or as a set and can be cleaned in the dishwasher.